Part of outdoor Way of the Cross that’s oldest of its kind in U.S.
ST. DONATUS — We can’t ever really know what the Virgin Mary’s face looked like when she first saw Jesus’ body after it was taken down from the cross, but with the help of great art, we can at least imagine it. 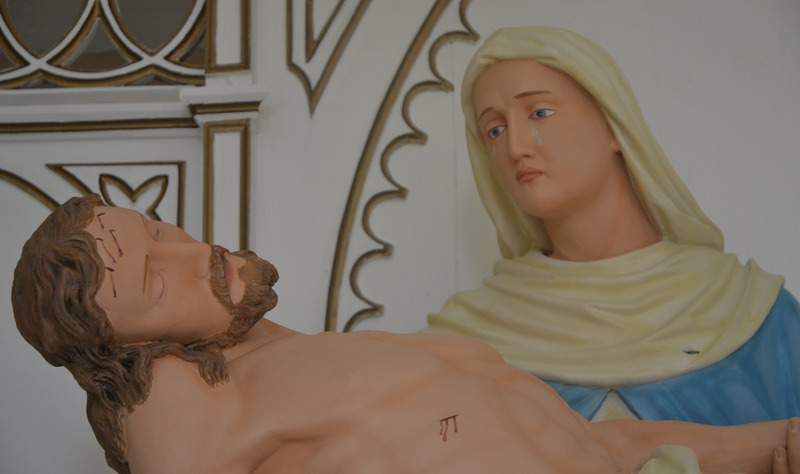 Since 1885, the Pietà statue on a hill far above St. Donatus Church in a rural valley in Jackson County has helped visitors bring the image to mind — that of a grieving mother, tears streaming down her face, as she holds her dead son in her arms. What would she have been thinking as she touched the wounds from his torture still wet with blood? In that moment, would the prospect of his coming resurrection bring her any peace or would she, like most mothers, be overwhelmed by sadness? Restoration specialist Nick Osterhaus had several days to contemplate these questions as he patiently repainted the sculpture created by artist Victor Thibeau of Luxembourg. A second statue by this artist was donated to a church in Schewebsange, Luxembourg. Osterhaus concentrated most of all on the faces. “I think the expression is the key thing,” said Osterhaus about what it takes to properly restore sacred statues. 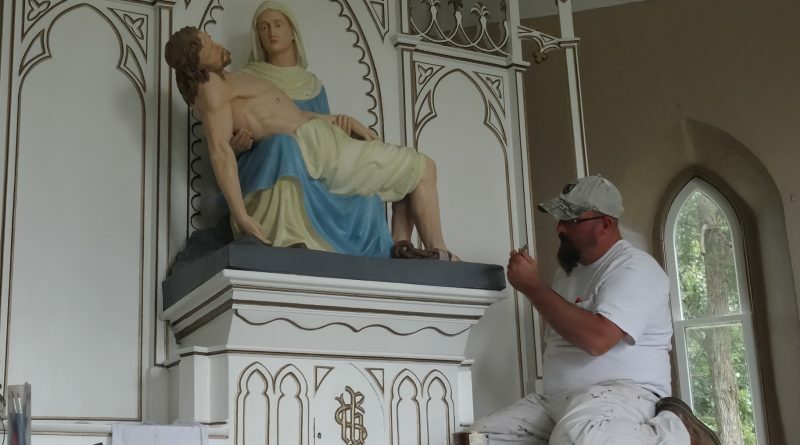 Osterhaus, an employee of John C. Kaiser Inc., a company that focuses on refurbishing churches and religious art, spent hours making sure to get the colors and shading of Jesus and his mother just right. 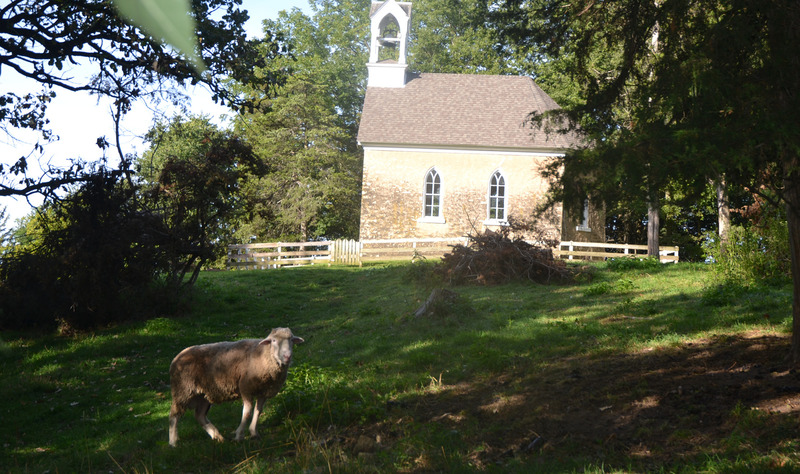 Since the hilltop was so steep and somewhat isolated, his only company was a flock of sheep who keep the grass short on the path of what is believed to be the oldest outdoor Stations of theCross of its kind in the nation. On a path behind St. Donatus Church, past a graveyard, the path begins to the Pietà chapel. Tourists and pilgrims from around the world come regularly to walk the hill, which is lined with lithographs depicting the 14 stations. On Good Friday each year, hundreds of people attend the traditional Way of the Cross service during which a cross is carried to the summit of the hill, and prayers are held in the chapel. Over the generations, the artwork, including the lithographs, their brick holders, and decorations inside the chapel, became worn and were restored at various points. 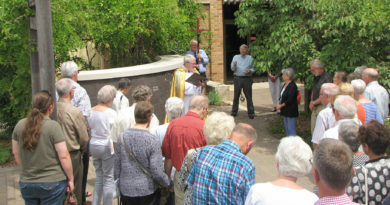 By February 2017, Bonnie Theisen and Mary Pat Breitfelder, co-directors of the St. Donatus Parish Museum, resolved to turn their attention to the statue. “I had seen the flaking on the paint and the different things, and I knew we had to do something,” said Theisen. 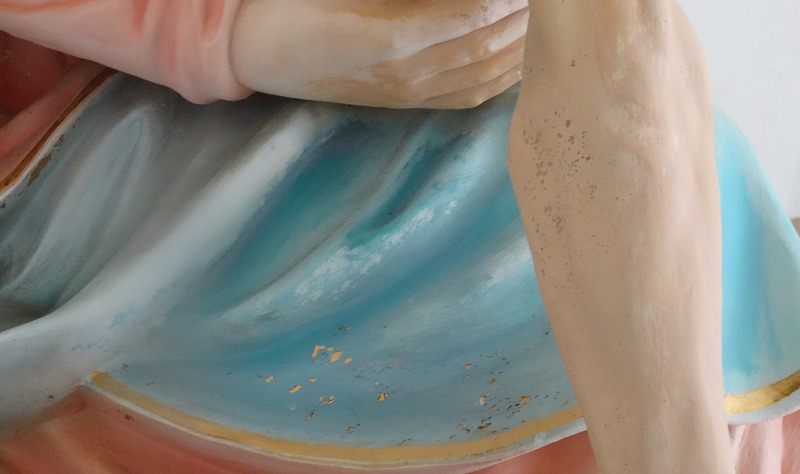 Aside from the flaking, an earlier attempt to repaint the statue had left it two-toned, since the painters had redone the front of the plaster sculpture, but not the back. 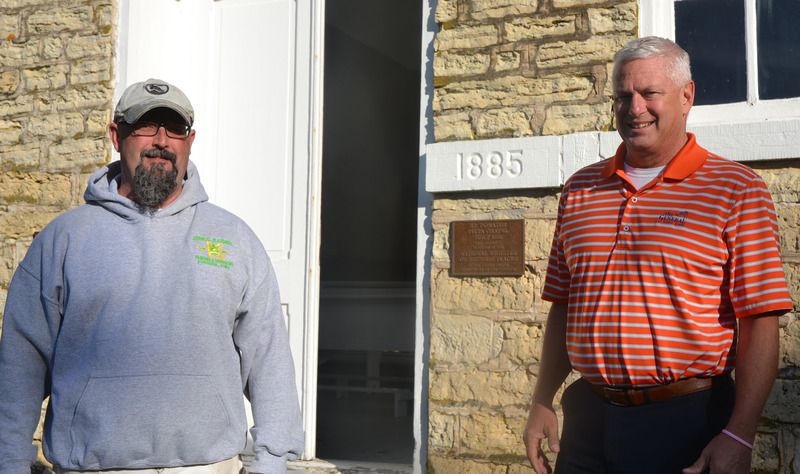 Nick Osterhaus, an employee of John C. Kaiser Inc., and company owner Scott Ganshirt in front of the chapel on the hilltop overlooking St. Donatus Church. Theisen and Breitfelder decided to apply for a grant from the Dubuque Area Racing Association. 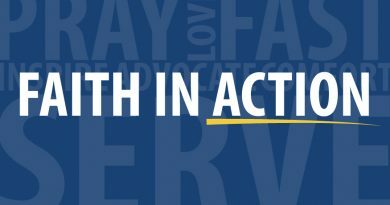 In March, the parish received a $2,580 grant. The two preservationists were overjoyed. “Every step we make to redo something, we’re helping to restore history,” said Breitfelder. John C. Kaiser Inc. was hired to do the job, which was overseen by owner Scott Ganshirt. 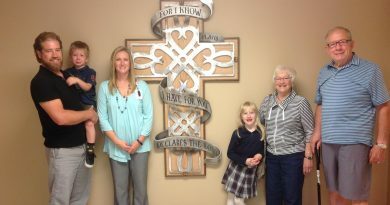 The company has done many restoration projects in the archdiocese, including most notably that of St. Francis Xavier Basilica in Dyersville. Completed in 2001, the endeavor took several years to finish. Ganshirt is the grandson of John C. Kaiser, the founder of the business. Since he was a young man, he has spent countless hours learning the art of restoration. Standing in front of the completed Pietà beside Osterhaus, he explained that working on beautiful art and churches has an impact spiritually as well as physically. “It reaffirms your faith,” he said. Osterhaus employed on the statue. “The older guys in our shop were willing to pass things down to the younger (workers),” said Ganshirt. The work in St. Donatus was unique for several reasons, not the least of which was because it was very difficult to get the tools and paints to the job. Because of the amazing steepness of the hill and the narrow roadway accustomed mostly to foot traffic, an early attempt to transport the materials with a pick-up truck proved too dangerous. Eventually, Ganshirt and Osterhaus came up with a solution. The town of St. Donatus was originally founded by immigrants from Luxembourg in the 1840s. 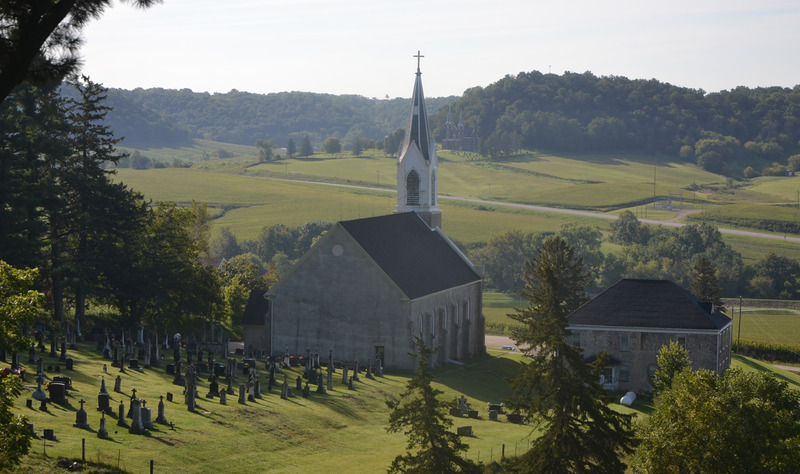 In 1852, a famous Jesuit missionary, Father Francis Xavier Weniger, erected a 40- or 50-foot cross on the hill where the chapel now stands, and he suggested a “Way of the Cross” prayer service be conducted on the site. By 1862, the stations themselves had been built and Father Weniger returned to see it. The pastor during this period, Father J.M. Flammang, began the tradition of praying the stations as pilgrims walked the hill. Father Ulric Frey, the pastor who followed Father Flammang, directed the construction of the memorial chapel to the priest that contains the Pietà. It is a replica of the Chapel du Bilchen near Vianden in Luxembourg and was finished in 1885, according to the history entitled “The Story of St. Donatus.” Both the chapel and the lithographs of the outdoor Way of the Cross are on the National Register of Historic Places. The parish itself is the only one in the United States named after St. Donatus, a second century Roman soldier and martyr who is the patron saint for protection against thunderstorms and lightening. The first log church was built in 1848, and a frame church was built in 1851. Ganshirt and Osterhaus are happy they could restore the Pietà statue, contributing to the ongoing Way of the Cross tradition which has been over 150 years in the making. 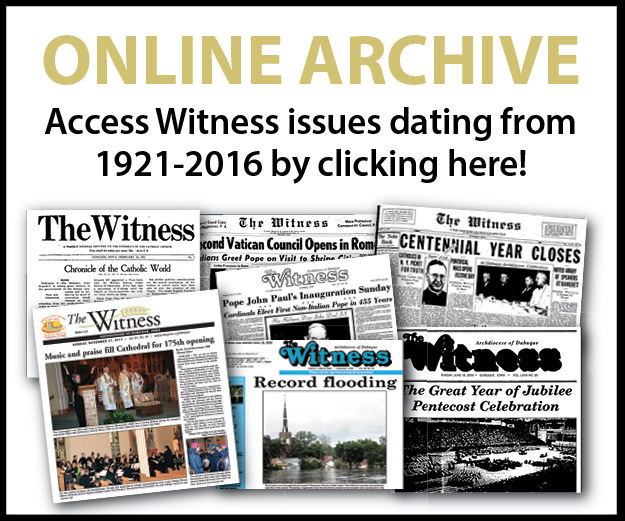 “There’s a sense of pride knowing this will last for generations,” said Osterhaus. 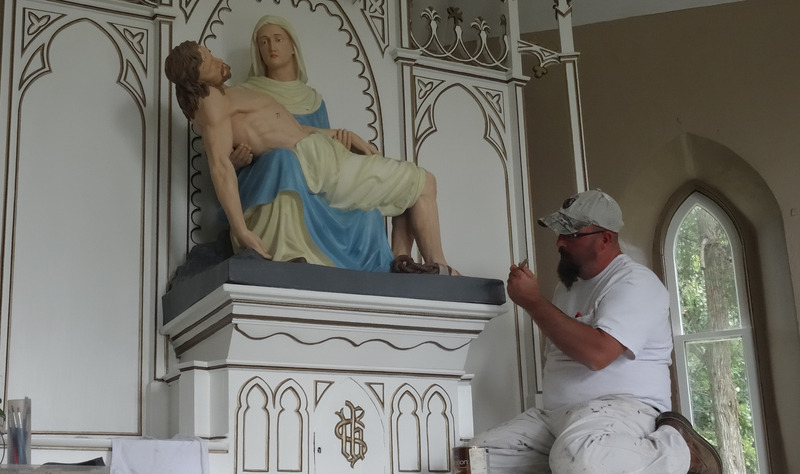 Cover photo: Nick Osterhaus paints the Pietà statue in St. Donatus.